Inspiring, thoughtful and compassionate - this guided journal is the perfect tool for you to keep your thoughts, reflections, inspirations, recipes, and to-do lists. Quotes and illustrations on each spread complement the helpful tips, anecdotes, and ideas from Colleen Patrick-Goudreau, author of the bestselling book, Vegan's Daily Companion. 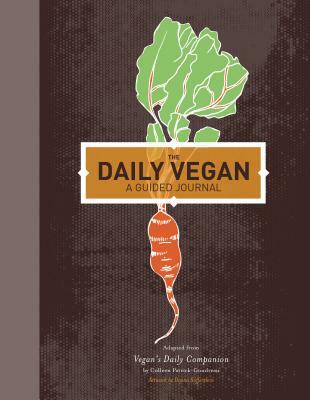 This guided journal is not only a useful tool, but the perfect keepsake for inner thoughts and love for animals. A recognized expert and thought leader on the culinary, social, ethical, and practical aspects of living vegan, Colleen Patrick-Goudreau is an award-winning author of seven books, including the bestselling The Joy of Vegan Baking, The Vegan Table, Color Me Vegan, Vegan's Daily Companion, On Being Vegan, and The 30-Day Vegan Challenge. She is an acclaimed speaker and beloved host of the inspiring podcast "Food for Thought," which was voted Favorite Podcast by VegNews magazine readers. Colleen has appeared on national and regional TV programs--including the Food Network, CBS, PBS, and FOX. Interviews with her have been featured on NPR, Huffington Post, U.S. News and World Report, The Chicago Tribune, The Miami Times, Pacifica Radio, and Rodale News--and in countless publications, blogs, and podcasts. Her recipes have been featured on Epicurious.com and Oprah.com, and she is a featured guest on Delicious TV's Vegan Mashup, a program that recently aired on public television in 41 states. Colleen is a regular contributor to Perspectives on KQED, NPR's San Francisco affiliate, which reaches 830,000 listeners weekly.